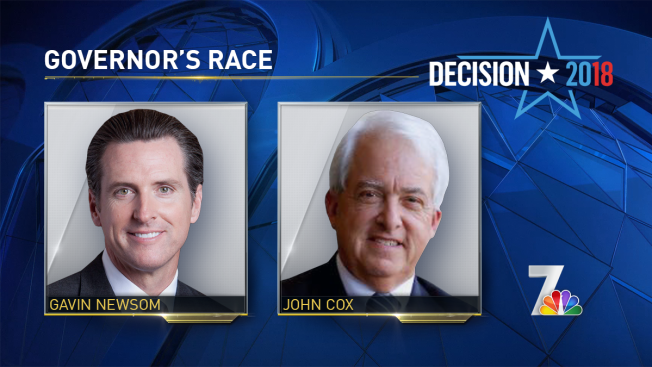 San Diego businessman and Gubernatorial candidate John Cox claimed a second place finish to Lt. Governor Gavin Newsom in the race to replace Jerry Brown as California's governor. As polls closed at 8 p.m. in San Diego County, Cox, a Republican, said he was “cautiously optimistic” about a runoff with Newsom, the Democratic favorite. Close to two hours later, Cox thanked voters and sent a message to Newsom, who previously said he’d prefer a duel across party lines over a runoff with another Democrat. “Mr. Newsom made it clear that he wanted to run against me instead of another Democrat. Well, as I told him in San Jose at the debate, be careful what you wish for," Cox said. Newsom and Cox traded the lead with about 30 percent each in early returns, with Republican Travis Allen and Democrat Antonio Villaraigosa about 15 points behind them. Brown, whose four terms spread over more than four decades are the most in state history, has not endorsed a successor. Because of California's "jungle primary ," the top two vote-getters — regardless of party — advance to a runoff in November. Newsom has said he would prefer to face a Republican and it's understandable because Democrats dominate in California. Republican registration has fallen for years and the party has not won a statewide contest in more than a decade, when Arnold Schwarzenegger was re-elected governor in 2006. The election is pivotal for Republicans looking to end their mounting struggles and gain a stronger foothold in the nation's largest state. For Democrats, who risk getting shut out of key congressional races, it has massive implications for their push to retake control of the U.S. House. Los Angeles County officials said the names of more than 118,000 voters were omitted from voter lists because of a printing error, but residents could still cast provisional ballots that will be counted once their registration is confirmed. Some counties reported light traffic at polling stations Tuesday, but officials pointed out many voters were mailing in their ballots. In the San Francisco Bay Area, for example, most of the voters at Berkeley City Hall were dropping off ballots they had received by mail. In the Central Valley, Kern County Clerk Auditor Susan Rooney said 49,000 of the 233,000 mail ballots sent out had been turned in as of Tuesday morning. Still, some people were eager to vote. Edgar Mito, a 77-year-old retired truck loader in Los Angeles who is a registered Democrat, voted for state Treasurer John Chiang for governor and for U.S. Sen. Dianne Feinstein because "she's got the connections and the power." He said he voted because, "it's my duty." "And I don't want what happened with Trump to happen again," he said, adding that he was away during the presidential election and didn't cast a ballot. "I think Hillary was going to win in a landslide. So now I want to get my word in." Dianne Feinstein is seeking another six-year term at age 84 and cruised easily into November. Her fellow Democrat Kevin de Leon, the former state Senate leader, was running closely with several Republicans for the second slot. In the race for governor, recent polls showed a surge by Republican businessman Cox, who was endorsed by President Donald Trump. Villaraigosa was seen as a major threat to Newsom when the campaign started, has tailed off. He campaigned furiously in the final days to close the gap. The other major candidates are Chiang and former education Superintendent Delaine Eastin, both Democrats, and Allen, a Republican. The campaign has played out largely under the radar despite millions of dollars in spending by candidates and their independent supporters. The closing days of the race were marked as much by dueling complaints over that spending as by differences between the candidates, their priorities and their styles of governing. Sean Spicer, 42, a San Diego resident who works in marketing, also said he voted because it's a civic duty — though he doesn't like California's top two primary system and said it is showing its shortcomings this year. "We have 7,000 candidates vying for governor and so the top two primary system means you end up voting for people who you think can win not who you believe in," he said. "He was already mayor of Los Angeles and I saw him do a lot for the Hispanic community," she said after casting her ballot. Cox, a businessman from San Diego has run unsuccessfully for a number of offices in his native Illinois but gained footing among California Republicans as the campaign progressed. He and Allen both aligned with Trump — Allen repeatedly noted Cox voted for Libertarian Gary Johnson in the 2016 presidential election; Cox said he regrets the choice — but the president chose Cox for his endorsement. "I don't think there will be a blue wave at all," registered Republican Keith Smith, 66, said outside a Solana Beach polling place where he voted for Cox. AP reporters Julie Watson in San Diego, Amy Taxin in Huntington Beach, Olga Rodriguez in San Francisco, and Amanda Lee Myers and John Antczak in Los Angeles contributed to this report.